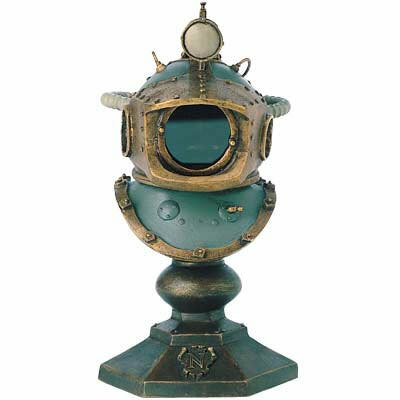 Description: Offered as part of the 50th Anniversary 20,000 Leagues Under the Sea limited edition merchandise, the Nautilus is a fully assembled, painted replica featuring lighting replicating the original film creation of Harper Goff. It is the most accurate model ever offered by the Disney company. 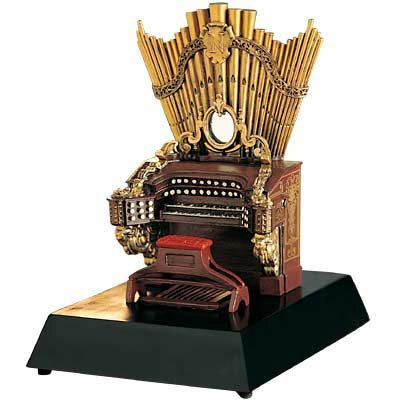 Features of this sub include those often missed by modeling enthusiasts, as theses were built from the original plans, which ensures that this replica is a first of it's kind creation. It was offered through the Disney company. Fifty years ago the Walt Disney Studios took moviegoers on an adventure deep beneath the surface of the sea to a world of mystery and menace. Jules Verne's epic novel 20,000 Leagues Under the Sea was adapted for the screen in grand style, being at the time of its release, the most expensive film ever made. In the 1950s Walt Disney's artists and craftsmen were the finest in the business and he combined them with the best filmmaking talent available in Hollywood. 20,000 Leagues boasts a stellar Hollywood cast (Kirk Douglas, Paul Lukas, Peter Lorre, and, of course, James Mason as Captain Nemo), but the most memorable "character" in the film is the Nautilus, Captain Nemo's fantastic submarine. With its frightening sea monster appearance and opulent Victorian interiors, the Nautilus roams the infinite underwater world piloted by its mad creator Captain Nemo. The look of the Nautilus came from the brilliant imagination of artist Harper Goff, who knew that the ship's design would be crucial to the success of the whole picture. " I always thought that the shark and alligator were quite deadly-looking in the water," Goff said, " so I based my design on their physical characteristics. The submarine's streamlined body, dorsal fin and prominent tail simulated the traits of the shark. The heavy rivet patterns on the surface plates represented the rough skin on the alligator, while the forward viewports and top searchlights represented its menacing eyes." Goff figured that Nemo would have built his Nautilus hastily and crudely, using only available rough iron salvaged from shipwrecks and riveted together by hand. Other special Goff touches were the round irising viewports that look out from Nemo's salon, saw-toothed rakers capable of cutting through the hull of a ship, and a skiff which fits into its own berth on the afterdeck. The Nautilus, as seen in the film, was actually built in a variety of different forms and sizes depending on the requirements of the production. 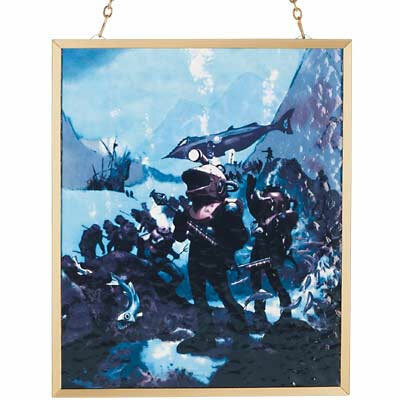 For underwater scenes, a detailed 11-foot long miniature was built, complete with operational lights in the wheelhouse and salon viewports and a revolving propeller. Powered by five car batteries and weighing more than a thousand pounds, this model was filmed in a tank on Sound Stage 3 at the Disney studios in California. For scenes in which the actors would be filmed on the sub's exterior, a full-sized deck and wheelhouse set were constructed of wood and fiberglass. After the film was completed, Walt Disney had the unprecedented idea of displaying the sets and other artwork in his brand new Disneyland park still under construction. The full-scale Nautilus sets, giant squid and all, were trucked from the studio lot down to Anaheim where they were displayed in Tomorrowland for eleven years. It was here that the intricate details of the world's most famous submarine could be studied up close and fuel the dreams of many young fans of the film. Today 20,000 Leagues Under the Sea is considered by film historians to be one of the greatest science fiction films ever made. Its thrilling story combined with timeless performances, powerful music and dazzling effects inspired generations of filmmakers to follow...but it's Captain Nemo's mysterious submarine cruising in the oceans' depths that still captures our imaginations. The Walt Disney Gallery is proud to present this 1/96 scale replica of the Nautilus, the most accurate representation ever offered. William Babington and Rich Allsmiller, who both hold a personal respect for the subject matter, have constructed the model with painstaking attention to detail. Allsmiller, an expert on 20,000 Leagues and the Nautilus, and who shared a close friendship with designer Harper Goff, has authenticated the model to be as correct as possible. The upper deck and wheelhouse above the water line are based on the full-sized sets used in the movie, while the body of the ship below the water line is an exact replica of the 11-foot long miniature. Cast in resin, this very special figurine commemorates the 50th Anniversary of Disney's landmark live-action film and is a tribute to the artistic vision of Harper Goff. 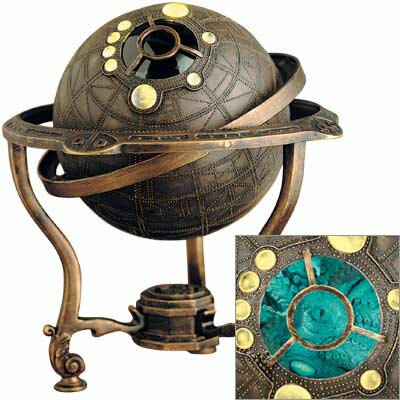 The Nautilus rests on a specially designed wooden base and can be internally illuminated just as it was in the 1954 film. Coming in March 2004 from the Disney catalog and at DisneyStore.com! 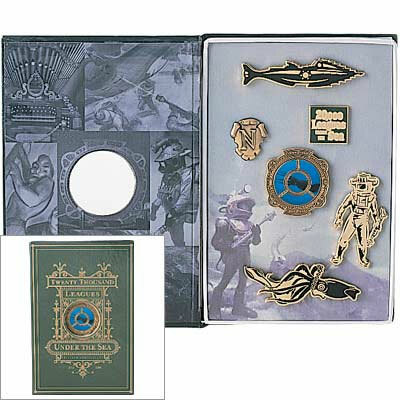 Honor Captain Nemo's greatest adventure, and this special anniversary, with our boxed pin set. 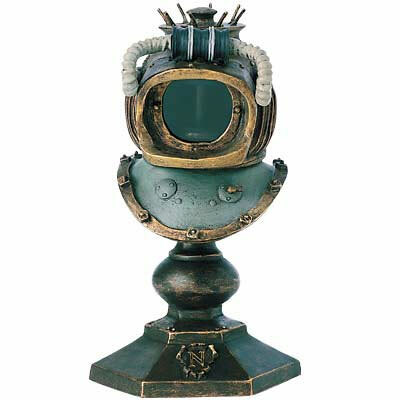 Set of six includes the Nautilus, Captain Nemo's crest from his pipe organ, the film logo, the viewport with a monster lurking outside, a crewmember in his diving gear and the giant squid. Far below the surface of the sea is the silent, watery world of Captain Nemo. 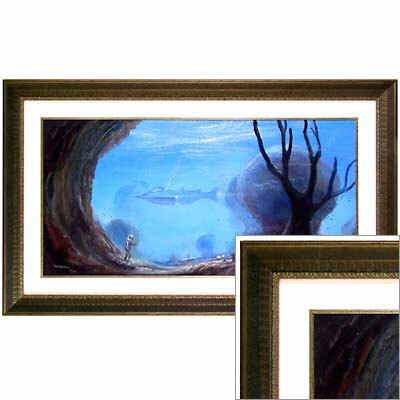 Here in this vast and mysterious place, Nemo and his crew walk the ocean floor while the submarine Nautilus, a dark mass, looms in the shadows above them. This piece marks the first fine art collaboration between Artists Peter Ellenshaw and Harrison Ellenshaw, his son. They chose to publish this piece using the Giclée process, since they feel that it is the best form of reproduction to properly bring out the dynamic colors that are seen throughout their original works. After the original illustration was scanned into a computer, artists skillfully perfected the colors. The digitally recreated artwork is printed onto canvas with an enhanced printer, specially modified for fine-art reproduction. Elegantly framed in antiqued silver molding with a Manhattan pearl linen mat and a matching silver filet. 18'' H x 36'' W image size. 28'' H x 42'' W framed size. Giclée on canvas. Wood frame. USA. Certificate of Authenticity. Signed Limited Edition of 195.